Cinnamon was one of DC’s Old West characters. She was introduced late, in 1978, and had but two stories during her debut. 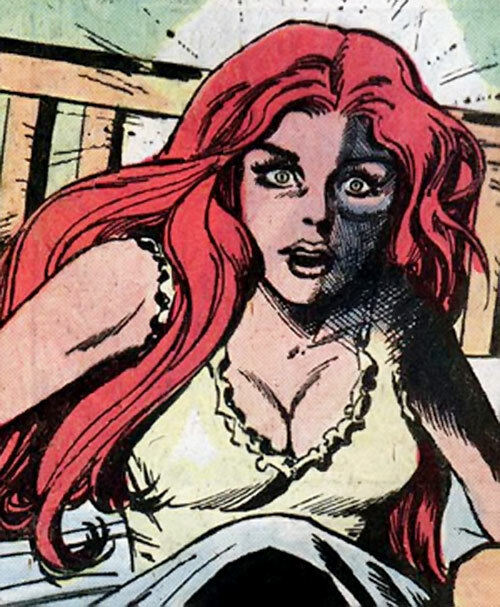 She’s generally a part of the DC Implosion era , though the book she appeared in wasn’t part of the waves of cancellation (Weird Western Tales endured until 1980). However, she then kept showing up in odd corners, perhaps because she had received a Who’s Who in the DC Universe entry. In particular she made an unexpected return in Hawkman, though the full storyline hadn’t deployed when this profile was done. Known Relatives: Unnamed father (deceased). Group Affiliation: Rough Bunch ; partner of Nighthawk. Base Of Operations: Mobile throughout the Old West. 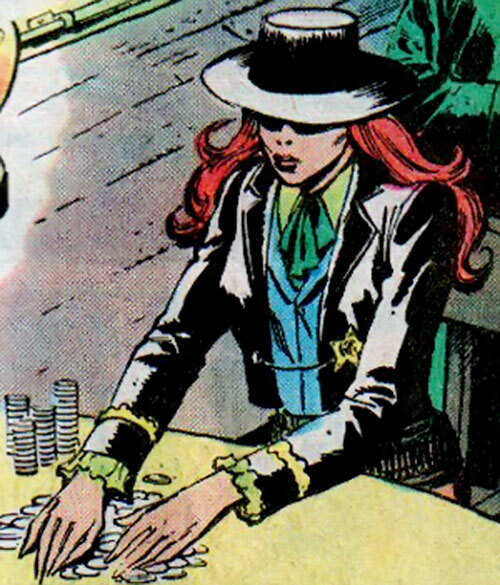 Cinnamon is a superior bounty hunter, gambler and athlete. She’s an incredible sharpshooter, able to casually shoot the belt buckle off a man without harming him. Cinnamon also is improbably deadly with throwing stars. Her reflexes are those of a true gunfighter, and she’s an observant and smart adventurer. Kate is primarily a handgunner in vintage appearances, wielding a single Peacemaker. Some one-image flashbacks depict her operating a lever-action carbine or dual-wielding Colts. One story had her with a side-by-side shotgun (though this one had a host of continuity issues). See our Old West Weapons Locker article for more about guns of that time. Cinnamon fights like a Chow Yun Fat character. She’s usually in movement, jumping to the side, rolling and finding cover while firing with deadly accuracy. Katherine Manser was likely born in the late 1850s. She was the only daughter of a sheriff in a small Wyoming town. When she was about seven, a posse of criminals robbed the bank. The sheriff intervened, but was shot dead right before his horrified daughter’s eyes. Manser spent the rest of her childhood in an orphanage. She dreamt of vengeance and trained herself to become a manhunter and a killer. After ten years, the orphanage let her go and she immediately began stalking. She killed the former members of the gang one by one, claiming the bounties to sustain herself. Though she was an expert with her Peacemaker, she often killed her with her signature weapon. It was the sharpened badge of her father, which she used as a deadly throwing star. Cinnamon was originally operating in the closing years of the XIXth century. Back then, Jonah Hex was already a legend from the past. But in all subsequent stories she was a contemporary of Hex, whose path she frequently crossed. After the DC Implosion, Cinnamon chiefly appeared when somebody was travelling back to the Wild West era (the 20-30 years after the Civil War). It was usually the occasion to have an ensemble appearance by a selection of American Old West heroes. The usual suspects included Nighthawk (Hannibal Hawkes), Bat Lash (Bartholomew Lash) or Scalphunter (Brian Savage). Many such Old West heroes (including Cinnamon) would eventually form a posse called the Rough Bunch. The Bunch was apparently created as they met during these coincidences-laden chronal disruptions. A 1978 case where the Master of Time chronoported away several amnesiac Justice League of America members. Kate Manser stumbled upon a disoriented Zatanna Zatara in a saloon, and shooed off the men harassing her. 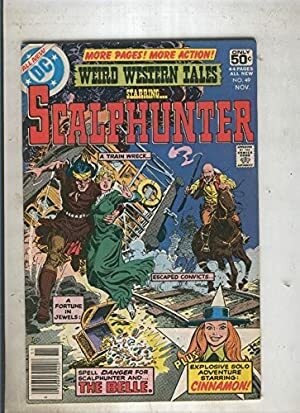 Cinnamon and Zatanna found other amnesiac JLA members who had also stumbled upon Old West legends – Scalphunter, Bat Lash and the dreaded Jonah Hex. The Leaguers then snapped back to their native era as Superman defeated the Lord of Time, after the Old West heroes destroyed robot infiltrators from the future. 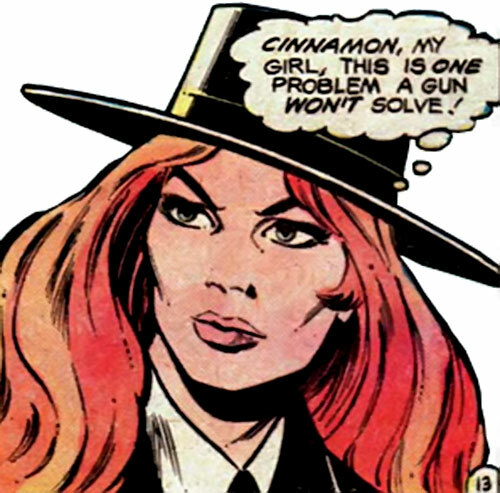 During the Crisis on Infinite Earths, Cinnamon was among the numerous heroes assembled aboard the Monitor’s ship by Harbinger and Alexander Luthor. Though she’s glimpsed from time to time, her adventures are unchronicled. At one point she and Firehair (son of Grey Cloud) investigated a dome habitat from the future. During Zero Hour , time collapsed and the villainous Extant attacked various eras. In the 1870s, he was opposed by a posse assembled by Nighthawk, which included Cinnamon, Matt Savage, Bat Lash, Scalphunter, El Diablo, Firehair and Johnny Thunder. The 2009 version of the Justice League was once cast back in time by Epoch. This time Cinnamon ran into Green Lantern (Hal Jordan) and Green Arrow (Connor Hawke). The two men ended up in a town ran by a deeply corrupt sheriff and were mobbed by the population. Manser, who had been observing the town, smuggled Hawke out. She then agreed to help him prevent Jordan from being lynched. The trio deposed the corrupt sheriff and his cronies. Cinnamon found and killed her last target, Emile Graydon, in St. Roch. During the firefight, an adventurer named Hannibal Hawkes (secretly Nighthawk) gunned down a man about to shoot Ms. Manser, possibly saving her life. The pair fell head over heels in love. They uncharacteristically shared a bed within hours. Unbeknowst to them, this overwhelming attraction at first sight was mystical in origin. They had been lovers through several past lives, and their first known incarnations were Egyptian prince Khufu (Hawkes) and princess Shiera (Manser). Not having any particular project now that her life goal had been fulfilled, Manser joined Hawkes in his activities as Nighthawk. Though she did not consider herself a heroine, she was unwilling to see her lover shot. In their first outing they saved one Cyrus Evans, a wrongfully accused man. They continued to operate together in St. Roch and repeatedly fought as heroes due to Hawkes’ sense of duty, though their project was just to live there. In St. Roch, a scoundrel named “Gentleman” Jim Craddock attempted to steal Manser’s signature badge. But she caught him and tried to wrestle him to the ground. When Hawkes stumbled upon the scene, he mistakenly though that Craddock was sexually assaulting Manser. Hawkes murdered Craddock in a blind rage. This act bound Craddock, now a spectre, to the lovers’ reincarnation cycle as the Gentleman Ghost. Cinnamon and Nighthawk occasionally continued to operate with some version of the Rough Bunch. The couple were usually the leaders of the team. One known incident had the Bunch (at that point Scalphunter, Bat Lash, the Trigger Twins, and unofficially Jonah Hex) take down the dreaded outlaw Bloody Jack. Much of the trouble was engineered by Matilda Roderic, née Dunney. She was a reincarnation of Hath-Seth, an ancient enemy of theirs. Mrs. Roderic eventually sniped Nighthawk dead, and Manser avenged her man – though she died in the process. The soul of princess Shiera transmigrated on to Shiera Sanders, who in 1940 became Hawkgirl. In 2010, the bones of Cinnamon — along with those of all past incarnations of Shiera and Khufu — were collected by Hath-Seth. These were used to build a magical gate to Hawkworld. The last conflict between Hath-Seth and the lovers took place at this gate, as they were all living their last possible incarnation. At that point, Shiera’s incarnation was Kendra Sanders. When Hath-Seth was defeated, all the bones briefly animated to grab their enemy. They dragged him through the gate, which then collapsed forever. Much later, during the 2000s, an admirer took up the Cinnamon identity, styling herself after Ms. Manser. Cinnamon openly wears her dad’s badge, though it hangs from a chain like pocket watch rather than being pinned to her chest. Her big iron and ammo belt are also evident, and she dresses to ride. Ms. Manser is a striking lady with luscious red hair and a fetching figure. Her beauty is abundantly commented about and results in quite a bit of bother. Still, it occasionally helps with convincing people. Cinnamon is a cold, distant manhuntress with a hair-trigger temper and reflexes. She’s fed up with being rudely lusted after by far too many men, and her zero-tolerance policy on the matter is endorsed by Colonel Colt. Since most such guys feel socially pressured not to publicly back down when confronted by a woman, much violence and death has ensued. She conducted her years-long manhunt in a methodical, professional manner. She carefully cased her targets. Manser then devised means to kill them under the best conditions and with the fewest side effects. Among her various ruses is one she used at least twice. Pretend to be a pretty airhead, reel her target into a cards game for money, visibly but non-provably cheat in a manner that will provoke them, and rely on her capacity to outdraw and outshoot them. This makes the kill a clear case of self-defense, especially if she was winning. Cinnamon was haunted by nightmares taking her back to the death of her father. But these might have faded once her vengeance was done. Though people keep calling her “Cinnamon”, she doesn’t like it. She isn’t the liking kind. She prefers to be called Kate. Meeting Nighthawk changed her taciturn, cold-blooded attitude. They both redefined themselves as each other’s partner. For Cinnamon — whose vengeance had just ended — this meant that she was now an heroine fighting for justice and to protect the innocent. Though she previously insisted that she was no heroine and no police, she became comfortable with her role as a do-gooder. And even as a grim lone avenger, Kate tended to be nicer and more sociable than most of the hyper-macho, highly aggressive Rough Bunch roster. Expertise (Poker), Schtick (Star-crossed Heart). SIA toward Avenging her father. Colt M1873 Army Model [BODY 03, Rec. STR 03, Projectile weapon: 04, Ammo: 06, R#04, Drawback: Very Long Reload]. Sharpened Sheriff Badge [BODY 04, EV 04, Note: Thrown weapon]. Source of Character: Pre-Crisis DCU (especially Weird Western Tales v1 #49-50, back during the DC Implosion. ).